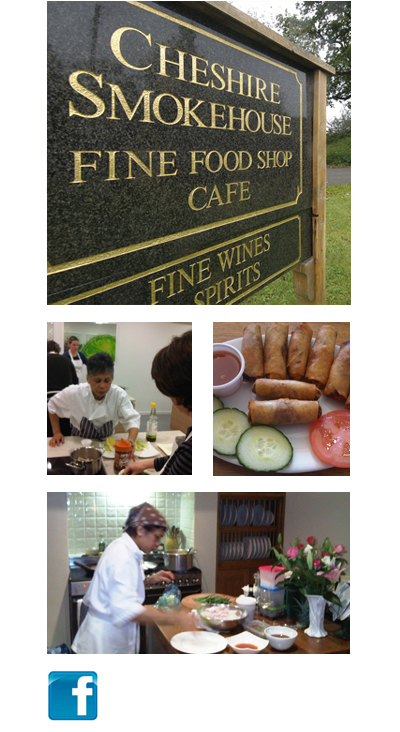 Cooking Demonstrations and Master Classes. Love Thai offer several aspects of learning how to cook Thai Cuisine. This is a simple cost effective way to discover the wonderful taste and flavour sensation that is Thai Cuisine. Chorchaba holds monthly classes at the Cheshire Smokehouse and other venues around the area that enable enthusiasts to develop their love for Thai food. Her simple demonstrations explain the basics such as ingredients where to buy and how to store them for maximum use so that students can return home to cook a complete Thai meal to impress their nearest and dearest. Full recipes and all ingredients included. All demonstrations are followed by a light meal of the dishes shown so that students can appreciate how the food should taste. For details of forthcoming classes please get in touch with us direct or with Cheshire Smokehouse on 01625 548499. One to One Master Classes. Clients can now learn in the comfort of their own kitchen. Chorchaba offers one to one Hands ON classes for anyone who wishes to learn how to create fabulous Thai food. After the class your family can sit down to enjoy a meal created using your new found knowledge of this wonderful cuisine. All ingredients and recipes are included. This is a memorable learning experience the whole family can enjoy. We can also offer Hands On group classes for family and friends at home. Classes for up to 8 people are a great way to enjoy a group activity for family and close friends. Call us for details of this unique cost effective learning experience. Curries. Chicken Yellow Curry. Pork or Chicken Green Curry. Beef in Red Curry or Panang Curry. Stir-Fry's. Chicken Chilli. Pork Chilli Bamboo. Beef Mushrooms and Oyster sauce. Rice's. Pineapple rice. Coconut Rice. Simple Aromatic or Egg Fried Rice. Chilli Rice with Meat.